Might it be possible that we’ve overlooked the presence of these bless-toting creatures right in front of us? Have we simply failed to believe what has been before us? Come to think of it, we have on occasion suspected we’ve spotted a butterfly quite intentionally fluttering about a number of adorable children and some would swear that they were holding wands! It can only mean one thing: they’re calling for a tiny changeling! 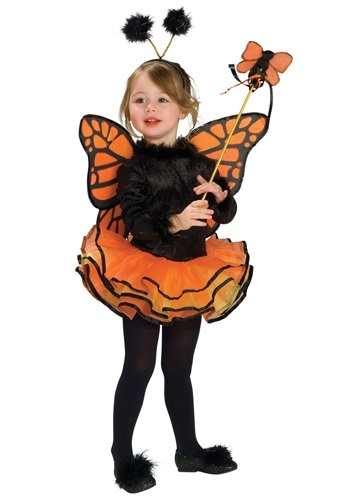 You and your tot can answer the call with the Girl’s Tutu Butterfly costume. A comfortable black leotard with a brilliant orange tutu is the base for this transformation, but several included accessories form the real magic of this faerie garb. The headband offers your babe her fuzzy black antennae so she can sense where hidden motes of magic hide and black shoe puffs ensure that she will bounce from one flower to the next, blessing each with a little faerie dust. Of course, the look wouldn’t be complete without the two most important parts: black and orange monarch wings (with Velcro for easy shoulder attachment) and the mystical butterfly wand! Awaken the spirits of the hidden world and give your little pixie a chance to show off her springtime magic in the fall! For the price I think it a great costume for whats included . My issue is with the quality of the print on the wings. There must be no quality control when these are being made. The print on the wings is missing in a lot of the areas and looks sloppy. If you don't mind fixing it yourself then the costume is nice. Also the Tutu is more yellow than orange. Outfit was very cute, but the wings are poorly constructed. Completely falling apart but the end of “trick-or-treating” with a toddler, which you can imagine, wasn’t very long at all. props to a very talented photographer who made this costume look great online. I didn't even try this on my daughter because it's so chincey it may have fallen apart. I chose not to return it due to the restocking fee and shipping fee. I'll chalk it up to a loss. wings: nylon stockings on a wire hanger. I couldn't even see the paint on them. They're clear. Tutu: what tutu? It barely exists and is attached to an impossibility thin 'crushed velvet'leotard. The picture looks way better then the actual costume for the price and what includes is perfect but for the quality of the costume is just not good I have to fix a lot of things with the costume like the stick and the wigs not worth the money ??? ?